While some Christians believe there is theological significance to Jews controlling their historic homeland, for many the reasons are practical, not theological. It’s been a week since President Trump declared that the United States would finally recognize Jerusalem as the capital of Israel. Unsurprisingly, Palestinian leadership called for three “Days of Rage.” Also unsurprisingly, some Christians have decried the move as Trump simply fulfilling his campaign promise to end-time-prophecy-obsessed evangelicals. These evangelicals are supposedly in error because they allow their theology to improperly influence their view of foreign policy. Yet there are numerous reasons—political, pragmatic, and biblical—that Christians are celebrating the news about Jerusalem. Here I decided to limit it to five. It may come as a shock to many, but the de facto position around the world is that independent states get to pick the capital of their country and have it be recognized as such. Israel is both an independent state and has picked its capital: Jerusalem. Many government offices are located in Jerusalem. The holiest site to Judaism (the religion of most Israelis) is in Jerusalem. Why shouldn’t the world recognize Jerusalem as Israel’s capital? Supposedly, it’s because for the last 50 years the city has been up for grabs and we don’t want to jeopardize peace by recognizing the reality on the ground. Yet every U.S. administration has used the status of Jerusalem as both a carrot and stick, and the Israelis and Palestinians are no closer to peace. In the age of whataboutism, the inevitable follow-up question to support for Israel is “What about the Palestinians?” Well, even before President Trump publicly announced the U.S. position, Palestinian Authority President Mahmood Abbas called for the days of rage. So regardless of what the actual position would be, violence was going to fill the streets of the West Bank. Missing from much of the commentary was that Trump never said the capital of a potential Palestinian state could not also be Jerusalem. In fact, Trump said the opposite: “We are not taking a position of any final status issues, including the specific boundaries of the Israeli sovereignty in Jerusalem, or the resolution of contested borders. Those questions are up to the parties involved.” It seems that the rioters are against recognizing any Israeli sovereignty over any part of Jerusalem, and that presents a serious obstacle to peace. For many Christians, support for Israel is not rooted in prophecy about the future, but in stories from the past. It is not uncommon for U.S. Christians to support Israel politically, but not theologically. These Christians see Jerusalem as the capital of Israel because it has historically been the capital of Israel. They do not ascribe any theological significance to the modern state of Israel or Jerusalem. For these Christians, Jesus’s universal message fulfills and supersedes God’s particular message to the Jews. That theological position does not prevent them from supporting Israel. These Christians support Israel because it’s the only real democracy in the Middle East that provides religious freedom and the rule of law. These Christians value consistency in international affairs and see mistreatment of the Jews by the United Nations and other international political institutions as an injustice against a people that has a long history of suffering. Of course, theology matters, and numerous theological views encourage Christian support for modern Israel and the Jews. However, for most of church history the dominant theology towards the Jews was pretty brutal. Five hundred years ago, Martin Luther called on Christians to antagonize Jews who refused to convert to Christianity. Four hundred years before that, Crusaders packed synagogues with Jews and set them ablaze. So the Christian trend of supporting the Jews and their return to Jerusalem is a fairly new phenomenon. Many claim that it is because of the rise of Dispensational theology, which teaches that Jews’ return to Israel marks the nearness of Christ’s return to earth. Certainly the spread of this theology has helped, but maybe it’s also because once we decided to stop trying to kill Jews we found we had more in common than we thought. Is it really such a bad thing that Dispensational theology helped Christians change their view of the Jews? Do we really want to go back to the days when Christians hated Jews, where we heaped the guilt of deicide upon them? Theology concerning Israel and the Jews does matter, and there is lots of good variety on the subject, but the railroad tracks leading to the death chambers of Europe should remind us of where anti-Semitic theology ends. Unfortunately, many Christians of the Middle East are unable to be objective about Jews and Jerusalem. In private, I’ve heard many whispered accounts from Christians about how they long for the freedom that the people of Israel enjoy. Publicly though, they are obligated to parrot the demands of the Muslims around them. The few brave Christians who have dared to speak with insufficient hatred of Israel and the Jews have been driven from the region, disowned by family left behind. In a recent trip to Jordan, I could not even get a Catholic priest to admit publicly that the Temple Mount was ever Jewish. The refusal of the head of the Coptic Church in Egypt to meet with U.S. Vice President Mike Pence should be seen as a statement by a hostage to fear of being on the wrong side of an angry Muslim mob. Now that the United States has recognized Jerusalem as the capital of Israel and the violent reactions are beginning to wane, it’s time for the hard work of peacebuilding and truth-telling to begin anew. There is more to the Middle East, Israel, and Jerusalem than the binaries and hatred often on display. Every day, Jews, Arabs, Druze, and Arameans work together, talk together, play together, and sometimes even pray together. Christians in the United States and around the world can celebrate with Israel and welcome Arabs and other peoples of the region to envision a pluralistic, multi-ethnic, multi-linguistic Middle East, where the rule of law and basic human rights flourish. 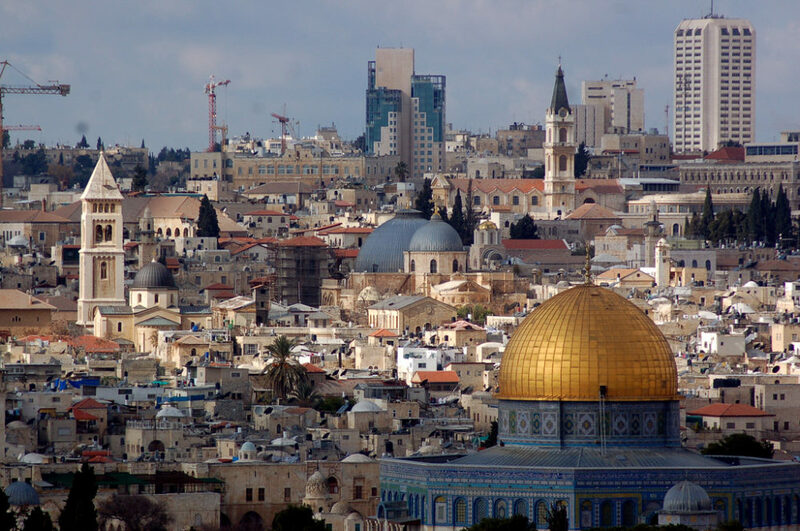 Changing the status quo on Jerusalem provides an opportunity for this vision to become reality.